This week started out with several phone calls asking me to sub this week and I'm so grateful. School was cancelled on Monday due to the weather, but I was still able to work at three days this week. Our Internet is on a data plan and therefore we have to be careful to not use it all before the end of the month. Google Chrome has added an extension for a text only browser to avoid using up all the data for the month. It's called Text Mode if you are interested. 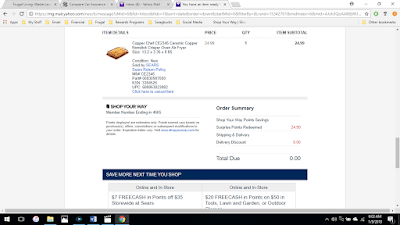 If you are a Shop Your Way rewards member from Sears or Kmart, be sure to check your account to see if you have any money to spend. I did that last weekend and had enough in my account to buy this free pan. It's a air fryer for the oven. I came home and made some baked potato fries in it and it worked really well. Best of all they gave it to me for free. We have not eaten out anytime since before Christmas. In fact I couldn't even tell you when the last time we ate out even happened. I've made dinner every night. Here is our menu from the last week. The Cream Cheese Chicken Chili was a new recipe for me, but turned out to be a keeper. Next time I will add a can of tomatoes instead of the tomatoes with chilies to keep the heat down some. Directions: Rinse and drain black beans and to pan. Drain corn and chicken and add to pan. Add canned tomatoes, but do not drain. Add spices, stir well and heat through. Add cream cheese an stir until melted. Serve over rice. I've not been grocery shopping lately either, so that is what we'll be doing this weekend, weather permitting. There is possibly bad weather in the works for Tennessee today and that will determine if we are wanting to get out of the house this weekend. That does sound good, Sluggy. My daughter wanted tortilla chips with hers, but I didn't have any on hand, so we substituted saltine crackers instead. 3 days to sub and Google Chrome time = $$$ in your pocket. 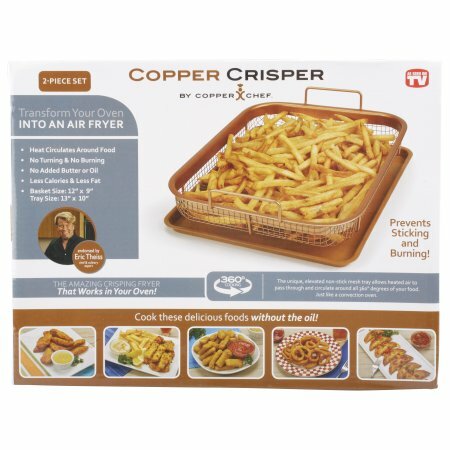 Would like to read more about your free oven air fryer as you use it. Eating out is not in our budget, but there are exceptions. When at Sam's, DH was asked to sign for a credit card. He would not be charged for the first $45. He earned another $10 with Sam's couponed products and paid tax on Sam's credit card, plus a few cents. Good deal. Needing a take-out lunch for guests, DH used Sam's "free" money from previous credit card purchase. We are otherwise a food-prepared-at-home family. Your deals matter. Keep telling us. Same here with the eating out, Anna. But we do like to eat out on special occasions like a birthday. I will definitely keep you updated on the air fryer. 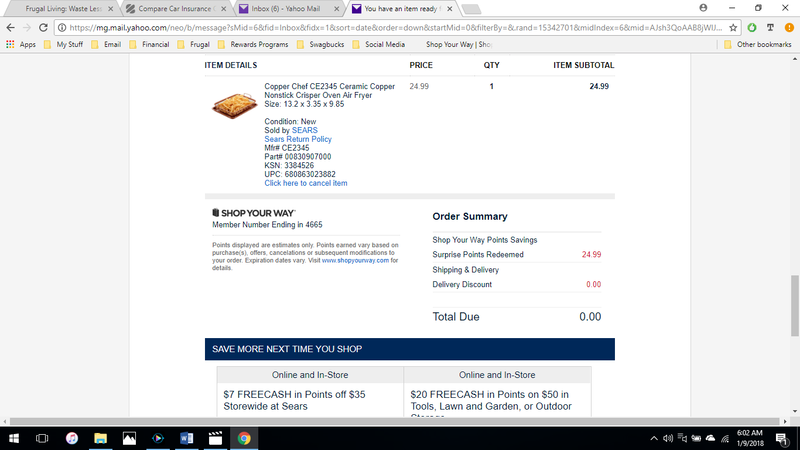 That is a great deal on the Sam's cc! Sears and K-Mart are slowly going out here. We have one Sears left at the Mall and one K-Mart left and it is supposed to be closing in March. Your meals sound lovely. I want to try that chicken dish - yum! Our Kmart closed here too. I was sad to see it go since that is where I could buy my daughter extra long socks. They are hard to find and they carried a good assortment of them. K-Marts closed and one Sears remains. Our Sears closed, but then a smaller Sears opened. I’m looking forward to hearing more about what you think about the pan. Thanks for sharing the recipe — sounds like something up my alley! You're welcome, Shara. I will definitely keep you updated on the pan. Did you ever try adding canned pumpkin to your chili? It adds a subtle, interesting flavor and is an easy way of getting pumpkin (which is good for us) into our bodies without all the eggs and sugar of pumpkin pie (which is delicious but not so good for us). And our Sears is on the way out as well. That makes me sad.